I thought this bunny up while I was trying to go to sleep and the next morning I had to make him in order to get him out of my head. Because there was no pattern he’s really simple and with several things I think are really worth mentioning. The most important thing to me was that he not have any parts that would be easy to pull off and swallow, since my grandson is under 3 and still puts everything in his mouth. So, no buttons for eyes or pom pom tail etc. Second, my husband had a wonderful idea for his tie (I was going to put a bow on his neck and tell my daughter in law to take it off before giving the bunny to the baby). The completely sewn on tie is a much better idea, I think. Third, sewing the blue jean fabric to the old blanket fabric before cutting the bunny out, made it much easier than piecing more pieces together. And my goal is always to make these things easy. I had a large piece of an old blanket left over from making dog beds. It was one of those “silk” blankets and the weave was pretty tight, so you could cut it up without it fraying on you. It had been the blanket on my bed for many years and the nap was worn down and the satin edging was coming off so I had replaced it. You could use any soft fabric (something that would be nice to the touch but sturdy). I recommend something recycled from you only because to me it makes the bunny a treasure passed down as well as a home made gift. I had a piece of my old blue jeans which no longer fit and I had cut up to use for various things. I had been practicing with various stamp inks to see what didn’t wash off in the machine. I decided those would make very “cool” retro looking blue jeans for the bunny. The fabric had already been washed so the ink was slightly faded and set. 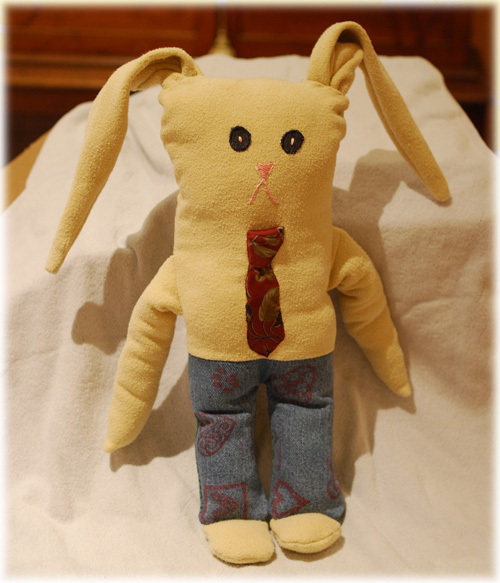 I sewed together a piece of blanket to a piece of blue jean fabric, to make 2 pieces each the same size with the middle where the fabrics met also at the same spot (so that when I sewed the bunny together his jeans would be the same all the way around). Then I took a pen and on the wrong side of one of the pieces I outlined my bunny. I drew just the head, body and “legs” –that is the jeans, without ears or arms. I also didn’t draw the feet. I later cut the ears, feet and arms out of the blanket fabric (I had plenty). More on those later. I put the wrong sides together and cut the bunny out, cutting through both pieces of fabric. Then I made him some feet (just long ovals, flat on one end). I just guestimated on the size. I made him arms, also guessed on the size, and wish I had made them a little shorter, but I also think little children like handles to carry their friends around with, so in that regard he’ll work perfectly. On his arms I cut the ends sort of in a point but not too pointed so they would look a little like bunny paws/hands. And lastly, his ears. I wanted floppy ears, but you could probably do stiff ones if you made them shorter and put something in them. I am sure there are tutorials out there for doing that. I just like the idea of a floppy eared bunny. Again, doubles of everything so you can sew the sides together to stuff them (except I didn’t stuff the ears, but I still made them double). I went ahead and sewed and stuffed the feet and arms and sewed them shut. 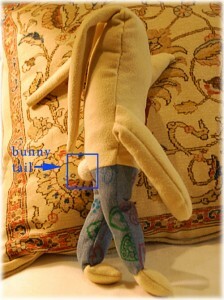 I used the machine, since the end would not show because it would be hidden inside the bunny. I sewed up the ears and turned them and also sewed up the end. Then I started sewing the body up. I machine stitched this body starting right at his waist, where his jeans meet his body, taking care to line up both sides. When I got to the bottom of his jeans (where the foot needed to go) I stuck the foot inside with the end that would be inside his body showing and stitched across it, sewing it into the bottom of the jeans (I wish I had taken photos, and I hope this makes sense –since you are doing this from the inside, the foot is really in what will be the outside of the bunny at this point, but you can’t see it). Then I sewed on up the leg, around down the other leg until I got to the bottom of the other leg where the second foot needed to go and did the same thing (foot inside and stitched across, sewing it into the bottom of the jean). At this point I turned it just to make sure I was doing the right thing. It was perfect, so I knew I was on the right track. Then I sewed up the rest of the side of the jeans, happy when I got to the place where jeans met body that they were right on! I did his arms the same way as the feet, sticking them into his body and sewing them in, inside out. (Be sure to check and make sure you get them both turned the direction you want them!) The arms were a little more difficult as they were quite long and I had to fold them up a bit. I was glad I had not overstuffed them. I did both sides but did not go all the way up the head, but only to where I thought I wanted to place the ears. At this point I had to decide if I wanted the ears closer together or more on the “corners” of his head. My husband helped me decide, and I think he was right. Because his head turned out so square, I think the ears at the corners was the best choice. I don’t know if you can really tell from the photo, but instead of just sewing them in flat, I folded them and bunched them so they would look a little more like a real rabbit ear. It made them a little harder to stitch in, but I think the effect is better. I stitched them in inside out just like I did all of the other appendages. I left an opening between his ears and pulled him right side. I was pleased with the result. I stuffed him (not too tightly) and then hand stitched the top of his head with thread the color of his chamois colored body (lucky that I actually had some in my sewing stuff, how remarkable is that?). Now, I had to decide how to do his face. 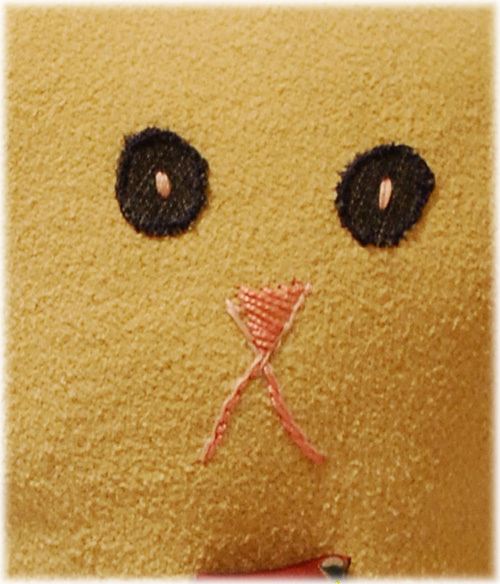 I made his eyes with a darker colored denim (sewed tightly in place -I think what I used is a blanket stitch, but I’m not positive, it’s one I picked up when I used to embroidery, I use it a lot to stitch things into place as it sort of locks each stitch so things are less likely to come loose). I stitched his mouth and nose in the classic X style you see so much on bunnies, but I only had a rather light colored pink floss and it didn’t jazz me. Later I ran to JoAnn’s and got a darker pink and outlined the mouth and filled in the nose and it really improved him! I also decided that the big dark eyes were sort of offputting so I stitched in a simple pink center and gave him a softer look. My husband had the idea for the tie, which was such a stroke of genius. I have been saving his old ties for almost as long as we have been married. I intend to make a quilt from them at some point, more about that another time though. His idea was to take the thin end of one of them and make a tie for the bunny! He had to tie the knot (I have no idea how to do that at all) and then I snipped it off, hand stitched that up and then hand stitched it all the way around with a thread that was the color of the majority of the tie. I admit my hand stitching is not really pretty, but I don’t think the baby is going to care. I think it looks awesome! The tie, not my stitching. Lastly, I fretted about a tail. I had really decided to let him go without even though a bunny without a tail is hardly a bunny at all. But those puff balls come off easily and really ARE a choking hazard. Then, for some reason I thought about the sweater cat I made and how I made her muzzle. And I thought there was no reason I couldn’t make a bunny tail in a similar manner. So, I found one of my sweaters in my sweater animal box that happened to be white and cut out a circle, filled it with batting, drew it up into a ball, tied some floss around it, cut off as much of the excess sweater fabric as possible and then sewed it tightly on, all the way around. The effect is more like a disk than a puff ball, but it will not come off and still looks like a bunny tail. Problem solved! My husband also helped with this one, I have to give him credit. He often comes through when I can’t figure out things. Oh ! Just love it, so sweet and fun ! Very nice creation my friend !